From 2001-2017, we used this website to ask for new information on the first generation of Petworth emigrants. The replies we received are listed alphabetically by the family names of emigrants. Background of Elizabeth Barnes before emigrating. Records from the House of Industry, Isle of Wight and the 1831 census. I don’t have much except details that I have discovered in searching my family history. William Boxall had a son, John Boxall who married Lucy Parfitt. Lucy’s son was Thomas Boxall who married Fannie Munro. They had a daughter Iley Frances Boxall who is my great grandmother. Research on Ancestry.ca whose sources include census, marriage etc records and some family information. I am doing family tree investigation. Looking for the names and any pertinent birth/marriage background information. The William Boxall I am looking into may be a very distant relative. Descendants of brothers John and Edward Bristow in Canada. Family Bible and interviews with son Thomas. I’ve worked hard to corroborate as much of their story as possible and posted onto my website. West. Penfold may be associated, I’ve not confirmed the relationship. Editors note: Five people from London went on a Petworth ship in 1832 but we do not know their names. It is possible that these four members of the Brooks family were among the emigrants from London. John Burberry, son of John and Rebecca, was born on 1st December 1816 in Loxwood, Wisborough Green. He died in Nelsonville on 29 January 1889 aged 72. His father and family reached Nelsonville in July 1832. Rebecca died soon afterwards and John was apprenticed to a tailor in Lancaster. He followed this trade until 1849 when he returned to Nelsonville and spent the rest of his working life in the service of L. D. Poston. He married Mary Thayer in Lancaster in May 1844. Mary was born in Wisborough Green in 1823 and had emigrated with her family on the same ship. Mary died in 1888. They had no children. "In disposition he was modest, sensitive and gentle; yet strong, patient and cheerful". David Burberry, son of John and Rebecca emigrated with his family from Sussex to Ohio. As a young man he moved to Kentucky. He married twice in Winchester, Kentucky and then moved to Chillicothe, Missouri about 1858 where he married for a third time. He had several children, was a painter by trade and a senior member of the Odd Fellows. David died in 1903 and was remembered as "a good man, loved by all". Philip Carey was born on 1 October 1815 and baptised on 29 Oct 1815 in Ashurst, West Sussex, the son of Stephen Carey and Lucy Hillman who had six other children all baptised at Washington, West Sussex. Philip Carey and Mary Golds were married at Wiston on 19 April 1835 'with consent of parents' shortly before the ship sailed. Philip and Mary Carey had 5 daughters born in Canada. Harriet Carey born 1 Dec 1834 Ontario; died 15 Sep 1906 in Port Hope, Huron, Michigan, USA; married 1856 George H Richardson. Jane Carey born Nov 1836 Ontario; died 31 May 1913 St Mary’s Perth, Ont; married 1853 Woodstock, Samuel Henry Mitchell. Frances "Fanny" Carey born 16 Dec 1840 Woodstock, Ont; died 26 Oct 1909 Fostoria, Tuscola Co, Michigan; married Apr 1856 Ontario, David Ira Harris. Sarah Carey born 8 Nov 1841, Brantford, Brant Co, Ont; died 17 Feb 1924 St Mary’s, Perth; married 20 Aug 1857 East Nissouri Twp, Oxford Co, Ont, Martin Nutt. Elizabeth Carey born 1843 West Flamborough, Wentworth Co, Ont; died 19 Dec 1908 Stratford, Perth Co. Ont. Mary Carey died between 1861-1867 probably in St Mary’s, Perth, Ontario no record yet found. Philip married again to Sarah Hodges from Ledbury, England on 27 Mar 1867 in Perth, Ont. Six more children were born. Anna Carey b 22 Aug 1865 Ont; died 6 Apr 1941; married 9 Sept 1903 London, Ont. William John Cook. George William Carey born 15 Feb 1869 Ont; died 16 Jan 1948; married 9 Mar 1923 St Thomas, Elgin Co, Ont. Julia Laforge. Lily Arnold Carey born 9 Sept 1869 Perth, Ont; died after 1923; married 5 Sep 1893 Perth, Horace Gordon Nutt. Lucy/Louise “Lou” Margaret Carey born 5 Oct 1872 Perth, Ont; died 27 Mar 1948 Santa Clara, California; married 11 Sept 1911 Santa Clara, Charles Chantler. 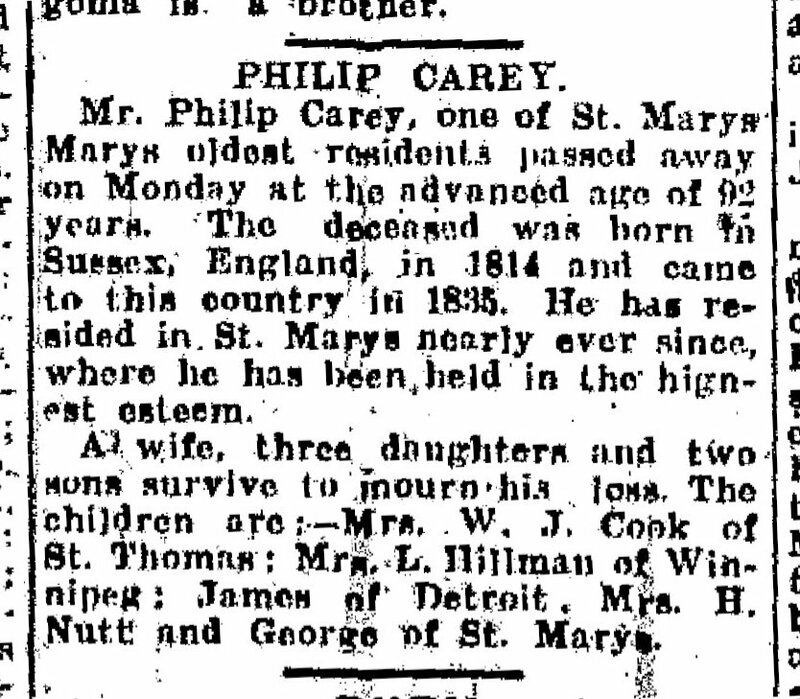 James Philip Carey born 4 Sept 1878 Ont; died between 1906-1923 probably in Detroit, Wayne Co, Michigan; married Julia. William Carey born 13 Oct 1880 Ont; died between 1906-1923. Ontario. Woodstock, Brantford and then West Flamborough. Ashurst parish register West Sussex Record Office par 11/1/2/1, Newspaper obituaries. Philip Carey, Sarah (Hodges) Carey. Census, marriage and death records online. Hillman, Richardson, Mitchell, Harris, Nutt, Hodges, Cook, Laforge, Chantler. Editor. We thank Lee Woods for providing the names of Philip’s parents which enabled us to find his baptism and we are indebted to Ronda Wickham for all her hard work researching the children of Philip’s two marriages and sending it all to us. For all further detailed information please contact Ronda Wickham. Relationship to my line of the Chantler family through Moses Chantler b. c1632 - d.Oct 30/1707 & Ann Wright, and their sons Moses Chantler m. Mary [--?--]. Their son Nathaniel who married Ellenor Fillary is brother to John who married Sarah Humphrey. In any event I have correspondence with a Ken Collinson who is a direct descendant of Nathaniel Chantler & Sophia Rowe through their son Dr. Henry Chantler & his wife Lydia Gurnsey (Guernsey). Private family collection and individual contacts. William and George Coleman left Canada and moved to Chicago, Illinois about 1840-42. The 1850 census shows William living with George and Elizabeth Voice Coleman and their family. In 1854, William married Mary Elliott, daughter of James Elliott and Mary Voice Elliott. Mary Voice Elliott was the sister of Elizabeth Voice and Cornelius Voice who accompanied her and her family to America in 1846. William and Mary Coleman had six living children, three died at birth. The Colemans moved to Kansas in 1858 for better land. William and Mary are both buried at South Cedar Cemetery, Jackson County, Kansas. George Coleman and Elizabeth Voice Coleman are buried there as well. These are the children of William and Mary Coleman. 1. Clara Ellen Coleman b 15 Apr 1855, near Chicago, d.15 Dec 1908, married Frederick Harwood, her cousin, they had three children. 2. Ernest Coleman b. 27 Jun 1858,Chicago, Ill.
Photographs of William’s children and a picture of a Coleman reunion, William was deceased and we have no picture of him. I am looking for the parents of William Coleman. Family lore says he was a nephew of Petworth emigrant George Coleman Jr. We believe William emigrated with his grandparents George Coleman Snr and Sarah Pollard, and three of their children Lucy, George and possibly John. I do have a copy of a photograph of a large group of Colemans in Kansas following their settling there in 1858. My Great Great Grandfather William Coleman (b1826) travelled on the British Tar in 1834 to Canada. A child, he travelled with family members headed by George Coleman, but apparently he was not with his parents. I assume he was born in or around Lewes, England, but I have been unable to determine his parents’ identities. Any information about my great grandfather Charles Crossin who emigrated from the Isle of Wight and settled in Waterloo County in the 1830s. The information in Assisting Emigration to Upper Canada is erroneous- concerning the family’s records in Canada. The Petworth Daniels were confused with the William Daniels family (wife Elizabeth Reed) originating in Devonshire, England, which arrived slightly later and stayed in Wilmot Township for several generations. Additional, known children born in Upper Canada to the Petworth couple were George (c1838) and Elizabeth (c1840). A child Jane Daniels age 5 is in their 1851 census household and has not been identified. Parents William and Elizabeth are not seen again after the 1851 census. Marriages and deaths have not been found for any family members except the son George. 1833 and 1837 census/assessments Wilmot Township; 1851 census North Easthope; marriage record of son George at Blenheim Township, Oxford County in 1865. Archives of Ontario vital records, census, marriage registers, cemetery transcripts. When and where did William and Elizabeth die? Did their son William marry? Who were the parents of Jane age 5 in the 1851 census? Who are William Daniels age 50 and wife Elizabeth age 53 in North Easthope in the 1871 census? I believe their daughter Annie born 1833 was married to Hugh CARGILL as they were neighbours to John and Clara Ford in 1851 census in South Dumfries outside Brantford. The Fords landed up in Essex, the Cargills in Parry Sound. The connection between the Fords in 1835 to the Cargills in Parry Sound. 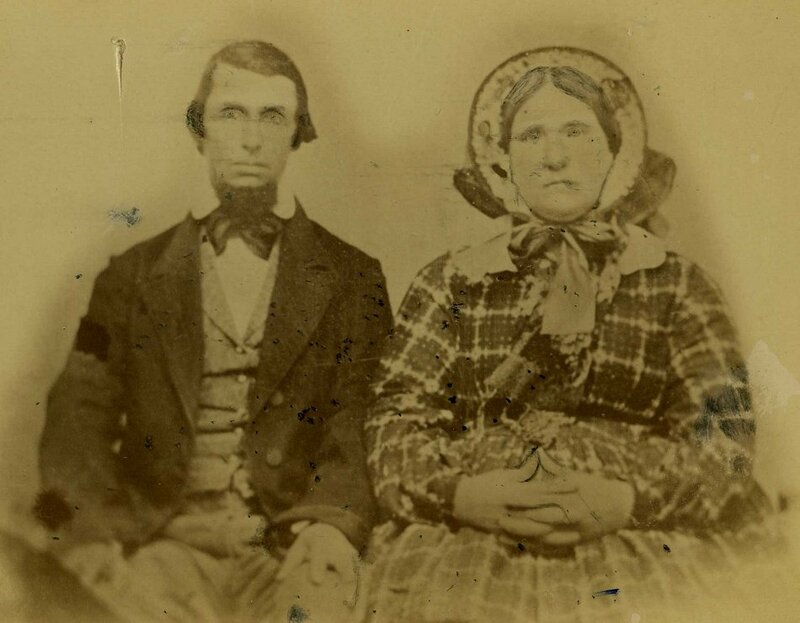 James Greenfield and his wife Prudence Powell emigrated to Canada c1835 with their sons James bap 4 Dec 1831 and George b 28 Feb 1834, bap 23 March 1834 in Duncton. Six more children were born in Brant County, Ontario: Annie b Dec 1835, Joseph b 1839, Agnes b 1842, Benjamin b 1848, Ruth b 1852 and Mary b 1855. 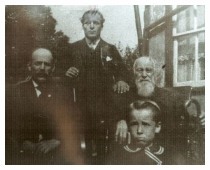 Four generation photograph, headed by George Greenfield born in Duncton in 1834. Duncton parish records, 1881 & 1901 Census of Canada, tombstone inscriptions, BMD records in Canada. We would like to find confirmation that the Greenfield family did emigrate with the Petworth Emigration Scheme. Bonham, Parsons, Robb, Nash, Osborn, Brown, Vince, Fair, Cowan, Ward, Rouse, Bacon, Steyning, Brockhurst, Pemberton, McLaren, Curry. NB Although Thomas Sockett was the rector of Petworth and Duncton, the records most likely to identify parish emigrants have not survived. Descendants of John Stephens Holmwood and his wife Leah Hopkins. I am looking for info on George and Margaret Hopkins and his sister Sarah. Sarah came to Canada in 1837 on the Diana with her 3 kids Emily, Haise/Esau and Isabella. No record of her after 1837. He was in the 1st Dragoon Guards and was awarded a medal at the Battle of Waterloo in 1814. Royal Hospital Chelsea Pensioner Registers of Soldiers Who Served in Canada, 1743-1882. William James was in this hospital in February 1819 and had his pension commuted on 18 March 1832 to assist him to emigrate to Canada. William was married and had a daughter, Mary Ann, born 1822 and a son, George, born 1825 in England. Mary Ann married on 29 April 1842 in London, Ontario. In L.A.C. there is an entry for William James that is asking for a grant to title for his property in Adelaide, Ontario on East Half Concession 3, Lot 19 so he could sell part of it. Document dated Aug 21 1837, that he acquired land from Col. Mount in 1832. Witnesses were Fred. Hasted and Joseph Paine who were neighbours of William James. Trying to establish whether William James emigrated with the PEC and to fill in the blanks between 1819-1832 and 1837-1840. Born in Bentworth, Hampshire. Much new information from family historian – please contact submitter. Also see more information on Facebook Group ‘Petworth Emigrants’. Adelaide, then Plympton. Many moved on to Michigan. The Longhurst line of ancestors and direct descendants. Anything concerning the family of Joseph and Sarah Longhurst, and their children including son George and his wife Rebecca, who also emigrated from Surrey on the Eveline in 1832. Hamilton (by immediate descendants’ marriage). Yarmouth, Ontario. Most of the Manns moved from Ontario to Michigan where most remain. 1871 Census Yarmouth, Ontario, Canada. Noah was the son of Petworth emigrants Samuel and Ann Mann. He married Elizabeth Sherwin and they emigrated with their children Noah Jr, Ambrose, Meshec, Shadrac, Hannah, and Ellen. I am seeking more information about Ambrose MANN, born c1828, son of Noah and Elizabeth. Was there also a William MANN among the children? Noah and his family settled in what is now Elgin County - Yarmouth township (no longer Yarmouth township). In the 1842 Census he listed as a tenant farmer on the lake road not far east of Port Stanley. In 1844 he purchased 150 acres - lot 22, first concession Yarmouth and also acquired 150 acres lot 23, 1st concession. These properties were mortgaged year after year and when Noah died on 28 March 1881, he owed his son-in-law John P. Martyn $4000.00 and interest. In the 1865 Sparta Directory it lists Noah and his brother Eli as manufacturers of stoves and agricultural implements. Elizabeth in 1881 went to live with her son Nelson (1881 census). She died 30 March 1882 (tombstone). Noah and his wife Elizabeth are buried in Sparta South Cemetery, Yarmouth township, Elgin County. Shadrack, born in Wisborough Green, Sussex 25 April 1832, was only 4 years old when his parents, Noah and Elizabeth and other members of his father's family left for Canada. Shad married Mary Ann Fielding about 1853. In the 1861 census he and Mary Ann and their three first children - Elizabeth (Lizzie), Lillian and Mary Ann - are listed as living in the township of Ancaster, Wentworth county (C-1085 - district 3) and Shad is described as a machinist. After 2 more children - Laura and Annie Maria were born to them, Mary Ann died 18 December 1864 and is buried in Sparta South Cemetery, Yarmouth township, Elgin County beside where Shad's parents, Noah and Elizabeth would later be buried. By the 1871 census Shadrack is living in Middlesex West, Strathroy Village and is described as a moulder (page 61, C-9901-2). He had married again to Ruth E. Foreman, who, I believe, was a widow with at least 2 children. In 1881 he is still in Strathroy, Middlesex East (C-13269). Shadrack and Ruth had at least 3 children, Frances, James and Arthur. Shadrack died at 298 George St. Sarnia on 18 April 1913 (death registration) and is buried in Lakeview Cemetery, Sarnia with his second wife Ruth who died in 1897. Also buried there are Art (1968) and his wife Ruth (1968) as well as Shad's first daughter, Lizzie (also died in 1913). Family Tree. Samuel Merritt and Harriet Lulham Merritt are my Great-Great Grandfather’s brother (Moses Merritt) and sister-in-law. I have photos and info on their descendants including Frederick Merritt who immigrated to Canada in 1912. Samuel and Harriet Merritt, with various children born from 1837 onwards, can be found in Sussex on the 1841-1891 Census. All children were born in Sussex. It seems quite unlikely that they emigrated to Canada in 1835 after all. It is just possible that they went with baby Thomas and returned the following year, but unlikely that Samuel, as an assisted emigrant, could have made enough money to return to England so soon. The Samuel Merritt age 35, with ‘wife and child’, who is mentioned in PHA142* could well be a different man with the same name. Can any Merritt descendants help clarify the Petworth emigrant? We are very grateful to April for bringing this to our attention. I am seeking information about George Morley, baptised 2 July 1820 in Lurgashall. He emigrated with his parents and siblings Mary, William, Hannah, James, Stephen, Michael, Edwin and Thomas. As a collateral Neal descendant myself, I have compiled a family tree of his relatives, the descendants of our common ancestor, his grandparents, John and Sarah Neal of Bignor, Sussex. All the information is publicly available but my compilation is, I believe, the most comprehensive so far. The descendants, if any, of the emigrant Richard Neal. My tree lists many collaterals, including Gadd (of Graffham), Hardham, Mann, Harwood, Linfield (of Storrington), White (of Chichester) and Laggatt. Canadian records Ontario and Manitoba of John’s son William Thomas Pennicott. William married Rachel Ann Free. Henry Peacock was born 21 April 1830, Petworth area, West Sussex, England. 1841 at Hampers Common, Petworth. 1847 or 1850 emigrated to Canada. First child Susanna with Martha Yearks/Yerks on 5 September 1854 in Canada West (probably Ancaster Township, Wentworth County) mother’s name from Susanna’s marriage certificate. Second child George with ??? Trainer, in April 1857, in Canada West probably Ancaster). Mother’s name from George’s death registration – suspect. Married Phoebe Elizabeth Cole on 19 September 1858 in Ancaster, have marriage registration. Henry and Elizabeth had 10 children all born in Canada West/Ontario between 1860 and 1884. I have a photo of Phoebe Elizabeth (Cole) Peacock in her later years. As above: birth registrations; marriage registrations; death registrations; Englad, Canada and USA censuses. Libraries, Archives, Ancestry Library edition. There was a Henry Peacock staying at the Albion Hotel in Quebec City on 14 July, 1847. This is on shipslist.com, and I have the newspaper clipping also, that I got from the Ontario Archives in Toronto. We assumed that this was our Henry Peacock from Petworth arriving in Canada, but your information is that he came over in 1850. Can you tell me where your information came from? Our Henry was married 2 or 3 times (at least his first 2 children seem to be from 2 different women) and lived in Ancaster Township, Wentworth County (1851, 1861); East Nissouri Township, Oxford County (1871); Vespra Township, Simcoe County (1881); emigrated to Michigan about 1888; is in the 1889/1890 Saginaw City directory in Buena Vista Township, Saginaw County; Buena Vista Township, Saginaw County (1900, 1910, 1920). He died in Buena Vista Township on 29 February, 1920. His wife, Phoebe Elizabeth (Cole) Peacock gave his birthdate as 21 April, 1830. and his parents' names as George Peacock and Elizabeth Forth. The problem is, we have Henry's father marrying an Eliza Holden in Fittleworth (near Petworth) on 24 June, 1822. Also, on Henry's marriage record to Phoebe, he gives his mother's name as Eliza, not Elizabeth. In my years of researching I have found that Eliza and Elizabeth are NOT interchangeable (I even have one relative named Eliza Elizabeth Twinn), so we think Phoebe was incorrect on the death record. She (or whoever gave the information) was very inconsistent on the 1900, 1910 and 1920 censuses, giving 3 different birthplaces for her father (all wrong) and 2 different birthplaces for her mother (both wrong). Henry and Phoebe had 10 children from 1860 to 1884, some of whom stayed in Ontario and some of whom went to Michigan with them. The COLEs and PEACOCKs intermarried 3 times between 1858 and 1917. Henry’s children married: Cole, Mason, McDermott, Butts, Dean, Bailey/Leach, Reinke. Editorial note: The source we have for Henry Peacock emigrating from Petworth in 1850 was the Public Record Office - now National Archives - MH12 13063 (Ministry of Health papers), where details of some parish assisted emigrants can be found. Correction to baptism information in Assisting Emigration, Section 2, Emigrants on Petworth Ships 1832-1837. Following recent research into Barnet’s Mill, we find that John Pratt was baptised in Woolavington, West Sussex on 7 Sept 1801, the son of John and Sarah Pratt. John Pratt senior was the miller at Barnet’s Mill and had taken over the tenancy from his father George Pratt. "...John Pratt, which I mean from Barnet’s Mill, he went out with us..." Continuation of Letters from Sussex Emigrants…Written in 1836 , 15-16; Letter from James Cooper, May 1838, Brighton Herald, 25 Aug 1838. Cowdray Archives no: 1884; Walking the Bounds of Lodsworth Parish, 1834 AM 21/1/3; Lodsworth Tithe Apportionment Book. Woolavington parish registers. Will of George Pratt of Woolavington, miller STCI/46 p424 19 June 1806. Land Tax IR 23. West Sussex Record Office. National Archives. We would be pleased to hear from descendants of John Pratt formerly of Barnet’s Mill. John Pratt was baptised 7 Sep 1801 at St Peter’s East Lavington, the son of John Pratt and Sarah Halstead Newman of Barnett’s Mill, Woolavington – one of nine children. He married Jane Grant /Garrett in Canada. They had six children:- Robert b1841; John S b1842; George Henry b1845 married Malenor Rands, four children; James b1846 married Mary A Rose, three children; Sarah Halstead 1847 married John Thacker, six children; Charles Newman 1850 married Martha C Lampman, two children; and Alfred b1851 married Sarah Ann Crawford, two children. John died 18 Sept 1882 in Woodstock, Ontario. In 1866 Thomas Galt and William Cayley, land speculators from Toronto, bought Lots 13 – 14, Conc 13 from the bank of Upper Canada. The following year Lot 14 was sold to Andrew Lensing, a wagon maker from the village of Hanover. The following year he sold to Hartman Ries, a blacksmith from Carrick Township. In 1872 Martin Woelfle of Sullivan Township bought the land from Ries. Apparently none of these owners made any attempt at clearing the land. In February, 1878 the land went to John Pratt from Woodstock. The next October a son, George Pratt, brought his family here from Woodstock also. They immediately began clearing the land and erecting buildings. In a short time they had a log house, a barn, a horse stable and a granary. The barn, horse stable and granary still serve as implement sheds today. The Pratt’s built the maple sugar camp that is still used in present times. Today the land has been cleared and the camp now stands in the open field, some distance from the bush. The present door and frame of the furnace was part of the Fensom sawmill which was located on the former Cremmen farm. In 1894 the present barn was built. Letter from James Pratt to his Aunt Thirza, wife of Newman Pratt. Letter from John Reeves to his brother-in-law Newman Pratt. Document written by my great grandfather Henry Pratt regarding a letter that his mother Thirza Pratt sent to James, and some other notes. Photographs of Alfred and George, sons of John; Newman and Thirza; and other family members. Family records (PDF: Pg 1, Pg 2, Pg 3, Pg 4); Sussex Parish Clerks www.sussex-opc.org; Canada Census; Oxford County Directory; Ontario Death Registration. Richard Pullen was born on 11 Sep 1790 in Sussex, England. Richard married Elizabeth Coleman daughter of Francis Coleman and Jane Payne in Northchapel, Sussex, England. Richard Pullen, his wife and 2 children, emigrated from Kirdford, Sussex, England as part of the Petworth Emigration in 1832, first residing in Adelaide Twp. By 1851 they were in Delaware and finally settled in Warwick Twp. Richard's second marriage was to Susannah Hawes on 27 Jul 1841 in Adelaide Twp. He appeared in the 1871 federal census in Warwick Twp. Richard Pullen died on 3 Nov 1878 Warwick Twp, at age 88; cause was not given on death registration. He was buried on 4 Nov 1878 St. Paul's Cemetery, Wisbeach. Richard Pullen should not be confused with the Richard Pullen [originally from Colhook Common, Northchapel, Sussex] of Delaware who married Frances Holden and remained in the Delaware area. Editor’s note: We would be delighted to hear of an original source for the information that Richard and Elizabeth emigrated with the Petworth Scheme in 1832. When we did the original research in 1990 we could not find any documentation in parish records etc to prove positively that the Pullens were included however it does sound extremely likely. The Revd Thomas Sockett said that 58 people emigrated from Kirdford but we were not able to identify them all. Mary married James PENFOLD, a farmer c1842. They settled at Waterloo and had 2 children. James died in 1847 and Mary married John B LEE c1849 and had 6 more children. Mary died on 16 Jan 1910 and is buried at Elmwood Cem., Winnipeg, MN. Phillip married Elizabeth STACKHOUSE on 29 Dec 1850 at (Blenheim Twp?) Oxford Co. They lived at Blenheim, Wawanosh and Chippewa Twps. They had 14 children Philip was a farmer and died in his barn on 8 Dec 1894 in Chippewa Co. MI. Isaac married Mary Ann WATKINS in March 1859 at Clinton, Huron Co. He was a farmer, died on 9 March 1904 and was buried at Ball’s Cem., Hullet, Huron Co. They had 5 children. Rhoda married John EDMESTON, a farmer, in May 1848. She died on 23 Dec 1872 and is buried at Ball’s Cem., Hullet Twp. They settled at Blenheim Twp and East Wawanosh and had 9 children. I can provide full names and dates of birth for all of the children, also some dates of death, as well as marriages and spouse names. Family bible, birth, marriage and death registers, cemetery records, obituaries, census. Hannah Rapson:- Harper, Griggs, Farwell, Mills, Stockwell, Burns, Kimball, Spaulsing, Matson. Mary Rapson:- Penfold, Dowsling, Lothrop, Wright, Wilcox. Philip Rapson:- Stackhouse, Brigham, Briggs, Sabin, Little, Cropper, Watson. Rhoda Rapson:- Edmeston, Rye, Asquith, Toll, Anderson, Whitelock, Jackson, Roberton, Ball. Thomas married Charlotte Tribe about 1835 in Canada, probably Waterloo Twp. Charlotte was the illegitimate daughter of his sister-in-law Sarah Tribe born 1819, Aldingbourne, West Sussex, before Sarah married James Rapson. Thomas and Charlotte had 9 children. I have dates of birth, marriage and death of all but one of these children. Charlotte Rapson died on 5 March 1852 and is buried at Princeton Cem, Blenheim Twp, Oxford Co. ON. Thomas Rapson was a farmer and died about 1880, buried at Colfax Cem, Huron Co. MI. Cemetery records, birth, marriage and death records. William, Maria and their children Fanny born in Lodsworth, William, John and Sarah born in Canada, returned to England when by 1851 they were living in Lodsworth next door to William’s elderly parents Phillip and Hannah Rapson. William was employed as a sawyer. Another child, George was born in Lodsworth c1852. Maria was buried at Lodsworth on 9 Jan 1895 and 3 months later William was buried on 3 March. They were both aged 86. All the children married and had families. - Fanny married Edward Hoad a wheelwright and they remained in West Sussex. - William became a blacksmith, married Caroline Ayling and moved to Hampshire. - John, a hoop maker/sawyer married Sarah and lived in Lodsworth. - Sarah married Charles Padwick, waiter/gardener/inn keeper’s servant. They lived in Petworth and Midhurst. Census records, BMD’s, Lodsworth parish registers. John Sageman born 18 December 1797 was buried in Verona Cemetery, Bad Axe, MI. Ann (Hambleton) Sageman b 25 Jan 1801 died 27 October 1862 and is buried at Christ Church Anglican Cemetery, Amherstburg, Ontario. Refer to page 270 in Assisting Emigration: A fourth child of William and Matilda Saunders "not found" was Emma. Born on 21 April 1828 at Wisborough Green and baptised on 18 May 1828 at Coldwaltham, Sussex. William and Matilda had four more children born in the US. William Saunders became a Justice of Peace, as well as a Brickmason. Ohio, Indiana, Illinois and Kansas. William’s first wife Matilda is buried in Indiana. A daughter of William and Matilda, Susan Saunders Uhl, my direct line, remained in Indiana. 1860 letter from William Saunders to daughter, Susan Saunders Uhl, photos of Susan Saunders Uhl and her husband, Peter. Family information, parish records, census records, vital records, deeds. Letter from William Saunders, who emigrated from Wisborough Green, Sussex in 1832 on the England, to his daughter, Susan Saunders Uhl in the USA. West Sussex Record Office. Letter in possession of LeAnn Shafer Eliason. Carroll County, Indiana; Piatt County, Illinoi;, Ellis and Pottawatomie Counties, Kansas. History of Carroll County, Indiana, by Helm. I am researching the English ancestors of William Saunders and his wife, Matilda Peskett. Bristow, Greenfield, Peskett, Puttock, Wilshire. Correction to entry in Assisting Emigration. Charles and Esther had five daughters who sailed with them; in addition to Sophy bap 6 Feb 1820; Elisabeth bap 2 Sep 1821 and Olive bap 29 Apr 1832 all in Wisborough Green, there was also Ann baptised 5 June 1825 in Felpham and Ellen bap 10 May 1828 Chichester. Their only son Thomas bap 25 Jan 1824 was buried in Wisborough Green on 3 Apr 1824 and therefore did not emigrate. I have two photographs of Sophy Southerton’s daughter Delilah Andrews. Sophy married Mordica Louis Andrews, and Delilah married John W. Kuhn. John Thair, b 1831 in Lodsworth, son of George and Rhoda Thair, was residing with Petworth emigrant Thomas Adsett at Woolwich Twp in 1851. Thomas had two daughters so perhaps a young man was needed to help on the farm. John married Hannah GOODWIN on 2 Feb 1854 at Woolwich, Waterloo, CW. Dundas, then Galt, Dumfries Twp. Where are Rhoda Thair (nee Rapson) and her two children Tom and Fanny aged about 25, in the 1851 Census of Canada? Henry Tribe is my 3rd great grandfather. He was part of the Petworth emigration with (some) of his family in 1832. His daughter, Charlotte married Joseph Evans sometime shortly after her arrival in the Waterloo area of Ontario.These are my 2nd great grandparents. A letter cited in your book was written from Charlotte to her brother back in Sussex, England and signed by her husband (Joseph "Neuroke" Evans). After some delay due to a cholera outbreak in the area, Charlotte and Joseph settled in Blenheim Township, Oxford County, Ontario and raised a family. Their first child, Connell, is my great grandfather. Joseph Evans died April 2, 1867 in Blenheim Twp. Charlotte disappears from any records after the 1871 census, so is likely to have died between 1871 and 1881, also in Blenheim Twp. The gravestone for Joseph, located in Washington Cemetery, in Oxford County is inscribed Joseph '"V" Evans. Is it possible that the transcription of the signature on the letter to England should have been Joseph "Vereker" Evans? This name (Vereker) is found in at least one of Joseph's descendants. Blenheim Township, Oxford County, Ontario. I have found evidence of a Joseph Evans born to William and Jane Evans in Rathkeale, Limerick, Ireland in 1795. Also, in 1798 Connell Evans, son of William Jones Evans and Jane Evans was baptized, also in Rathkeale. Perhaps a brother to Joseph. There are ancestral records of the name Connell Vereker back to 1679 in County Cork, Ireland. One of these is Connell Vereaker, born in County Limerick, in 1747. His daughter, Jane, born 1776, in Limerick could well be Joseph and Connell's mother. Unfortunately, I have not been able to ascertain her marriage to William Jones Evans. Editor’s note: The letter was a printed version, taken from Emigration Letters published in 1833. We have never come across the original letter so cannot look at the handwritten signature. 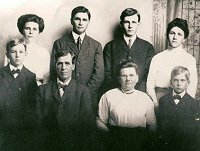 Not sure what I have is new; I can go back 6 generations and forward 7 generations from John and his brother George who emigrated with their families to Plympton and Adelaide Twp in Ontario. John at Lot 9, Con 9 Plympton, Lambton Co, Ontario and George near Waterloo. Considerable; too many to list. Child, Gilbert, McConnell, Menten, Twist, Street, Brown, Livergood, Main, Woods, Schenk, Townshend, Brighton. They moved from Blandford Ontario, to Chicago, IL USA and then to Northport, MI leaving descendents numbering in the thousands. Chicago, IL, then many came to Northern Michigan in the 1850 to 1870's. Have photos of many of the family members. We have the lineage for the next five generations. Bible records; parents & grandparents. Check the websites for this extended family. They are recorded in the court records and censuses of the USA and Canada. Contacts in Sussex England also. Finding the Voice family and their descendents in USA and Canada. Also researching the family of their oldest daughter, Mary Ann, who emigrated in 1846 on the Northumberland. Smallwood, Hall, Waterbury, Coleman (came on British Tar), Budd (also emigrated to Canada), Smith, Foster. Cornelius and Elizabeth came with 7 children. William, John, Elizabeth, Cornelius Jr., Martha, Joseph & George. Joseph was my great-grandfather. John Voice was born on 19 July 1812 in Dover, Kent, the son of William and Mary Ann Voice. His sister Eliza was baptised in Cheriton, Kent in July 1815 while William was a soldier stationed at Shorncliffe Barracks, Cheriton. William Voice had married Mary Ann Brevill on 3 Sept 1811 at Saltwood, Kent. They eventually returned to Billingshurst where William died in 1820. His widow Mary Ann then married widower William Bridger, a farmer at Wooddale Farm, Billingshurst and they had more children. John emigrated on the British Tar in 1834 with the family of his uncle, Cornelius Voice. John Voice married Jane Muzzoll on 15 May 1840 in Michigan City, Indiana. He signed the certificate as John. It seems likely that John and Jane had a daughter Matilda born about 1840 but then separated. The 1860 Census shows a daughter Matilda aged 20 living with his family. John later changed his name to George Voice, a fact questioned by his sister Eliza in a letter she wrote to him in 1840. George (John) Voice married Elizabeth Shaylor Clement on 26 July 1845, he signed the certificate ‘George’. They had six daughters - Mary Elizabeth 1847-1849; Ellen Jane 1849-1867; Louisa Maria 1850-1941; Elizabeth Emma 1855-1872; Annis Amy 1857-1863 and Harriet Amelia 1862-1930. Three letters written to John and sent from West Sussex – two from his sister Eliza in 1840 (from Thakeham) and 1847 (from Amberley) and one from his Mother Mary Ann Bridger in 1846 (from Billingshurst). They were transcribed and annotated by Leigh Lawson for West Sussex History, the journal of the West Sussex Archives Society and used here with permission. Gravestone in Indiana cites date and place of birth. Declaration of Naturalisation Form 8 March 1845. Baptism, marriage and burial records. 1860 Census report LaPorte County, Indiana. Kent Record Office, Billingshurst Library, Ancestry. Any information regarding Jane Muzzoll Voice and the Muzzoll family, and Matilda Voice. Editorial comment. We are very pleased to learn the identity of John/George Voice. He was only mentioned by his first name, 'John' in letters written by William Voice in October 1834 and Cornelius Voice on 20th September 1835. We understood that he was a nephew but were not sure of his surname. William also refers to ‘Mr Bridger and Rhoda’ – we now know that Mr Bridger was William who later married Mary Ann Voice, and that Rhoda (also known as Ruth) was one of his daughters from his first marriage. Lorraine Bear is the great-grand-daughter of John/George Voice and we thank her and her family for sharing with us the informative letters sent to Michigan from West Sussex. William and Charlotte (Longhurst) Willard - lineage parents. John Worsfold - lineage/parents (We are descended from him through his wife Maria Willard) I have traced many of the names down through Ancestry.ca see White Family Tree. Benjamin White was baptized on 11 Mar 1792 in Bignor, the son of Benjamin White and Mary Wicker of Bignor, and the older brother of Luke White who married Frances Ann Humphrey. Benjamin married Mary Boxall on 29 Nov 1814 in Arundel. Benjamin and Mary had 9 children born in England and at least 2 more born in Canada. Both Benjamin and Mary may have been deceased before 1852 as no record of them could be found in the 1851/52 census of Ontario, and their younger children were all living as strays in households of the older siblings or neighbours. Familial links were found for 9 of the children; and because the names and relative birthdates matched those that were baptized as children of Benjamin and Mary White, this couple was always suspected as being the progenitors of this family. From the township memories “Early Days of Innerkip Township” by Zella Hotson (Nov 1952), it was known that William White who married Margaret Wallace and James White who married Lizzie Turner were cousins of the children of Luke and Frances White. However, finding confirmation of the names of parents in either marriage or death records of the children proved very frustrating, and unsuccessful for over fifteen years. The early marriage and death records found in Ontario were before the times when parents’ names were listed. The early marriages found in the United States did not give parents’ names either, and all the death records that were found had “unknown” written beside the section for names of the father and mother of the deceased. Recently, a second marriage record was found for their son Thomas White b. ca 1834 in Ontario, wherein he names his parents as Benjamin White and Mary Boxall. Since Thomas was not born in England, this document definitively proves that it was Benjamin and Mary who were the other ‘White’ family that came to Canada. Also, in the 1851/52 census of East Zorra Township, Thomas was listed as a stray in households of both James and Charlotte (White) Barney and William and Margaret (Wallace) White. By 1854, James and Charlotte (White) Barney moved to Concord Twp (Sheffield), Bureau Co., IL. , and in the 1860 census, Thomas is in Bureau Co., IL, and also in the 1865 special census of Concord Twp, Bureau Co., IL. In the 1870 census of Clinton Twp, Franklin Co., IA, Thomas is living next door to Solomon and Mary (White) Bearinger. Mary (White) Bearinger moved back to Michigan, but Thomas continued to live in Iowa until his death in 1926. Conversely, his mother and father were listed as “unknown” on his death record. ... John White bap 17 Sep 1815 Arundel; died in 1861 Brantford, Brant Co., ON. Married Mary Ann Bailey ca 1837. At least 4 children. ... William White bap 29 Jun 1817 Bignor; died 16 Jun 1900 Innerkip, East Zorra Twp, Oxford Co., ON. Married Margaret Wallace on 13 Oct 1851 in E. Zorra. At least 8 children. ... James White bap 13 Aug 1820 Bignor; died 24 Feb 1889 in Tallmadge, Ottawa Co., MI. Married Elizabeth Turner ca 1854. At least 7 children. ... Benjamin White bap 24 Mar 1822 Arundel; ... no trace in Canada; possibly died young. ... Mary White bap 2 Nov 1823 Arundel; died 26 Mar 1902 in Deerfield, Mecosta Co., MI. Married 1. Joseph Bearinger on 14 Oct 1849 in Zorra, Oxford Co., ON; m.2 Solomon Bearinger on 7 Jun 1869 in Grand Rapids, Kent Co., MI; and m.3 Michael Lyons on 19 Mar 1878 in Altona, Mecosta Co., MI. At least 1 child. ... Charlotte White bap 11 Dec 1825 Arundel; died after 1880 census in Concord Township (Sheffield), Bureau Co., IL. Married James Stewart Barney on 28 Jun 1847 in Blandford, Oxford Co., ON. At least 3 children. ... George White bap 7 Oct 1827 Arundel; … no trace in Canada; likely the George White that died 28 Nov 1829 in Arundel, aged 2 years. ... Susan White bap 3 Oct 1830 Arundel; died after 1871 census Brantford, Brant Co., ON. Married James King ca 1851. No apparent children. ... Andrew White bap 29 Feb 1832 Arundel; died 23 Oct 1900 Cheboygan, Cheboygan Co., MI. Married 1. Mary Ann Rosenberger on 8 Mar 1863 in Kent Co., MI; m.2 Alice Awnhood (or Alice Ann Hood?) on 15 Oct 1882 in Wheatland, Mecosta Co., MI. At least 5 children. ... Thomas White b ca 1834; died 8 Jan 1926 in Butler Twp, Butler Co., IA. Married 1. Elizabeth Cannam ca 1860 in Bureau Co., IL; m 2. Phoebe Gamble nee Hayden on 23 Jun 1904 in Allison, Butler Co., IA. At least one child. 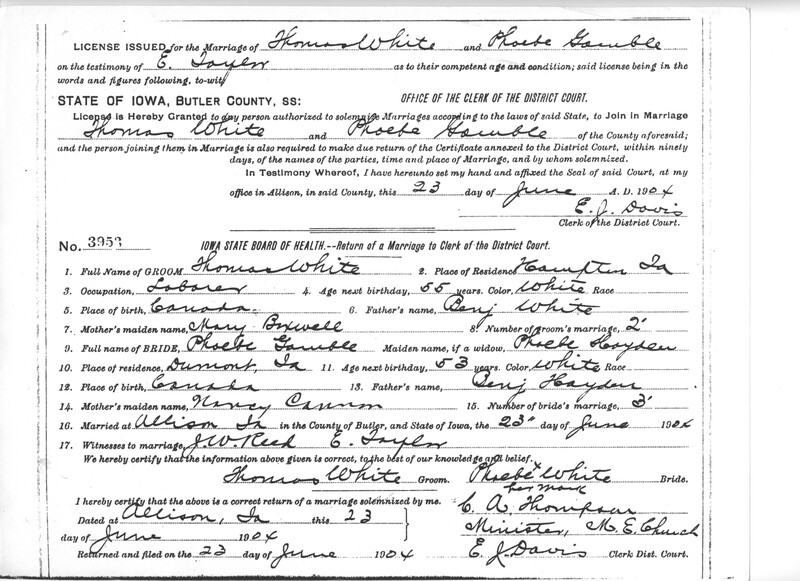 ... Edward White b ca 1838; died after 1880 census of Deerfield, Mecosta Co., MI. Married Mary Jane Lyons ca 1876. (Mary Jane Lyons was the daughter of Mary White’s third husband, Michael Lyons). At least 4 children. Copy of 1904 marriage record of Thomas White to Phoebe Gamble in Butler Co., IA. In this record, Thomas names his father as Benjamin White and mother as Mary Boxall. Also, additional research. Archives, libraries, microfilm and currently on Family Search and Ancestry. Bailey, Barney, Bearinger, Boxall, Cannam, King, Lyons, Rosenberger, Turner, Wallace. Editor’s note: As Deborah says, the family must have emigrated either in April 1832 or April 1833. Arthur, the last child born in England, was baptised in February 1832 and the first child to be born in Canada was Thomas in 1834. The precise date of Thomas’s birth is unknown but Frederick Hasted mentioned in his letter of February 1834 that he had seen ‘the two Whites’ – whom we now assume to be Benjamin and his brother Luke. Hasted wrote "The two Whites, told me they had their expenses paid by the kind interposition of Squire Hawkins of Bignor Park and for which they seemed grateful". Three ships sailed in April 1832, Lord Melville, Eveline and England. The England sailed in April 1833. Luke White was baptised on 19 July 1801 in Bignor, one of many children of Benjamin White and Mary Wicker of Bignor. On 6 May 1823 he married Frances Ann Humphrey at Bury, West Sussex. They had 4 children born in Sussex and 4 more born in Canada. ... Emma/Emily White bap 8 Feb 1824 Bignor; died 10 Aug 1850 Oxford County. Married James Moore 1844 in Oxford Co. At least 2 children. ... William L White bap 26 Mar 1826 Bignor; died 1907 Oxford Co. Married Anna Marie Croft (Kraft) born 1829 in Germany. ... Luke White bap 18 May 1828 Bignor. Moved to Michigan with brother James Anderson White. ... Walter White bap 31 Oct 1830 Arundel. died 30 Sept 1864 Oxford Co. In Canada – all born Wentworth County, Ontario. ... Ellen White b 27 July 1834, died 10 July 1854 aged 19 years 11 months and 13 days, Oxford Co. Married Donald MacLeod. At least one daughter, Frances b 17 Feb 1853, Brantford, Ont. ... Matilda White b 28 Oct 1837, died 20 Feb 1868, Oxford County,Ont. Married John Charles Jury (b 1837 Waterloo – d 1911 Kansas) on 24 Nov 1858. At least 4 children. ... Kissar (Mariah) White b 10 Feb 1838, died 26 Aug 1889 Perth Co, Ont. Married Edwin Chown (b c1838 Kenton, Devon, England) on 8 Dec 1861 at Brantford, Ont. At least one son. ... James Anderson White b 27 Dec 1840, died 22 Jun 1927 Marlette, Michigan. Married Rachel Locke (b 1850 Oxford Co – d 1890, Marlette) on 8 May 1871 in Oxford Co. His brother Luke moved to Michigan with him. I have a few photos of some of their later descendants. Most of the sources were found on Ancestry. Evans, Losee, Cook and so many more. Editors note. In 1991 we found and recorded Luke and Frances White with their four children in Bignor, West Sussex, but with no overseers records or vestry minutes extant for Bignor, we were unable to be certain that they were the 'two Whites' paid for by Squire Hawkins of Bignor Park, who were mentioned in a letter written in February 1834 from Fred Hasted in Adelaide Township. We are very grateful to Lee, for providing us with the information that Luke and Frances were indeed in Canada by 1834. Thomas Sockett noted that 16 men, women and children emigrated from Bignor in 1832, but did not name them. Ann was living in Hamilton in 1851 with her daughter, Mary who emigrated from Dorking with her mother. In 1856 they emigrated from Ontario to the U.S. settling in Beloit, Rock county, Wisconsin. She died on 6 Nov 1870 in Beloit. Her daughter Mary, married name McCrimmon, died on 6 July 1887 also in Beloit. U.S. Federal census of Wisconsin 1860 and 1870. Newspaper obituaries, Beloit Journal, 23 Feb 1871 and Beloit Free Press 7 July 1887. Census found on Ancestry.com, newspapers found Wisconsin Historical Society. John and his sister Mary came to Canada with their mother Ann Woolgar. Ann’s husband William had died in Surrey when the children were small. John lived near York. In 1850-51 he married Angelina Kelly. They bought a farm in Binbrook, Wentworth, Ontario. Had four sons: William, George, John, and James. (William was my great grandfather). The elder John Woolgar died in Dec. of 1878 in Binbrook. Angelina and the 3 youngest sons continued to live on the farm until 1903 when it was sold. Two sons emigrated to the United States and another son went to Saskatchewan Angelina went to Alberta with one son and his family and died there in 1905. What became of Ann Woolgar and her daughter, Mary Woolgar after they arrived in Canada? Angelina Kelly was born in Upper Canada but I have been unable to find any records for her. I am seeking the lineage/parents of John Worsfold who married Maria Willard in Canada in 1834. I would also like to find out about the emigration of George and Ann Heppenstall [not with the Petworth project] who arrived in Canada – probably from Yorkshire - around 1830. John and Maria Worsfold’s daughter married a Fearnley.